Description: Huntsman commissioned ProHunter to create a watch for the modern Huntsman. The silver bezel and black strap, inspired by the grosgrain facing of a tuxedo, give this custom watch an understated elegance, making it the perfect watch for not only business meetings but also black tie events. As ever Huntsman has had a subtle bespoke treatment made to the finish and case of the Military Subdate. 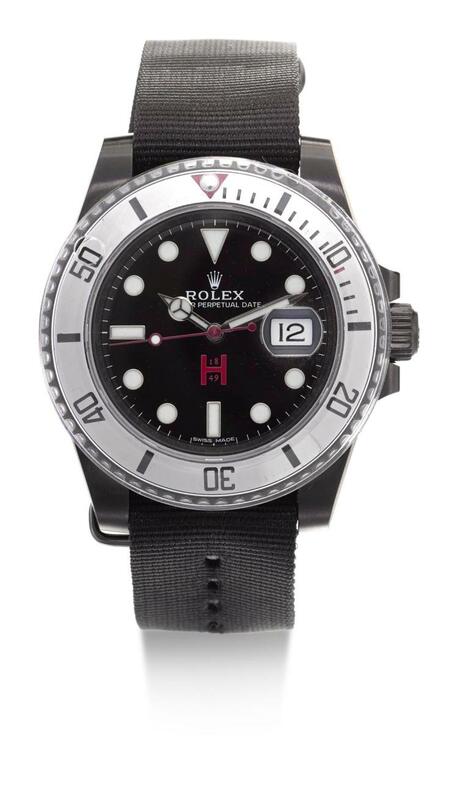 All original Rolex parts were used by ProHunter for this limited edition of 11 pieces. This watch is number 001. Accompanied by a Pro Hunter presentation case. Condition: Movement running at the time of cataloguing. The dial and hands in very good condition. The case too in good condition the watch appears to have never been worn. The watch has not been tested to determine the accuracy of its timekeeping. Please note that Sotheby's does not guarantee the future working of the movement and that a service may be required at the buyer's discretion.